Last weekend I attended The Australian Beauty Blogger Weekend. Apart from generous goodie bags there were also presentations on hot blogging topics. The talk on how to monetise your blog with key note speaker, Bahar Etminan was particularly outstanding. Not only because of its practical value but also because of the impact it had on the audience. They were divided in their opinions and Twitter has exploded with heated comments. Many bloggers in the room, it seems, felt offended. Bloggers, who are they? What do they want? Why do they blog? There is no single answer and that was primarily why Ms Etminan’s presentation was so controversial. Not all bloggers see their blogs as a business. Yet other bloggers would definitely consider themselves as having a full time job. Blogging is a recent phenomenon. It does not have a clear definitions, standards or regulations and therefore it will continue creating controversy up until all questions have been answered. Sometimes even the bloggers themselves haven’t clearly defined what they are doing online: a hobby or a business? Talking from a business paradigm to a blogger is not always a right approach. Simply because for many of us blogging is a hobby. It is a very personal by its nature. Blogs are to their owners like children: cherished, loved and the most beautiful in the whole world. Would you say to a parent – go make money out of your child? Unlikely! Similarly, you can’t push bloggers to monetize their blogs. They will, if they want to. Most of the bloggers I know, are highly educated professionals who blog out of their own interest and out of their own pocket. If they can afford Chanel creams, do you really think they will be interested in obtaining a free nail polish? It is a big mistake to think that all bloggers want is a free product or to make money out of their blogs. The blogging community is very diverse. You simply can’t put all bloggers in one bucket. Different people write about different things and for different reasons too. Every blog has a unique voice and this is great! The essence of blogging is the freedom of expressing yourself. Most of the bloggers enjoy having an open honest dialogue with their readers and other bloggers. You can’t buy that just like you can’t buy true friendship. Business is very different. There are no friends only competitors. It is an environment where money rules and success is measured in gains. In the blogosphere, we like to think of each other as friends, mentors, experts, etc but not competitors. We socialise, shop and dine together. We learn from each other. We may be a little bit competitive – like parents with their children, but we are not going to back stab each other to get the deal (as often it happens in a business environment). We value the integrity of our community more than a personal gain. I, at least, would like to think so. Feel free to correct me if I am wrong. I hope the above helps to clarify who we are and why we blog. There is no right or wrong. If you want to blog for the love of blogging, that’s wonderful. Yet if you want to make money out of your blog and choose it as your profession – that is also great. But we should not judge each other for our choices. Same as we can’t judge a lawyer for working in a law firm or a person for collecting stamps or butterflies. Decide for yourself who you are – a business woman or a woman with a great hobby. Think about where you stand and what you want for yourself and your blog. Find your own answers to these questions if you haven’t already and don’t worry about the diverse ways in which others approach blogging. The important thing is to go forth happily with the clear voice of an individual and a warm respect for your readers. I totally hear you on that and I personally agree- I wont even read blogs that are about pushing products. I think it cheapens the experience and you can tell when someone is not giving an honest opinion. I think some large blogs though do have ads to pay for some of the expenses related to the blog, but I dont think they are really profiting. I adore writing and photography – one of the reasons why I blog. I do not blog for money – I have a day job which I enjoy and love. Fantastic post. My blog has grown to be part of my business but it wasn’t planned that way. Who knows how it will all pan out but at the heart of everything I do and write is a love of that. 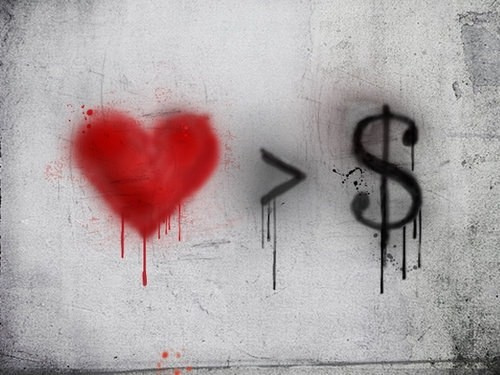 Without love, there’ll never be any money! it just fell on mixed ears, like Styling You said very often we start out with no intention of blogging for business but may end up there , it’s all a journey , who knows what’s at the destination but as long as we enjoy the ride and learn from our experience and our peers along the way we will end up where we are supposed to go. I totally agree with you gorgeous. Passion, love and dedication will always out last monetary satisfaction. That is the only way I can still blog 7 and a half years later. Great post, blogging is my hobby, my indulgence and my way to communicate with the outside world. As a reader of beauty blogs in particular I personally don’t care for the ones that turn themselves into beauty websites and seem to be constantly churning out sponsored reviews and no other interesting content. So true about blogging being a personal choice. It’s up to us what we make of it and yes, whatever decision we choose to take – it should be respected by the blogging community. My blog is my baby, as you mentioned, i am definitely like a parent! It is also my hobby. I am studying full time and very excited to start work as a dietitian, but there has also been the beauty obsessed writer in me as well, and blogging is my outlet. I agree with some of the posts, i dont buy or even pay much attention to blogs which seem to be pushing product, they lose their honesty and i feel that i need to take it with a grain of salt (there have definitely been things i have bought that are no where near as good as they say they are). If my blog did become more of a business i wouldnt be adverse to that, as long as i could always write my own opinions. Great post M. I think many of us start blogging as a hobby and the opportunity to make a small/large income presents itself when PRs or company’s come knocking. There’s room for everybody in the blogging community, but what won’t be tolerated is where the blogger thinks of their followers or readers purely as a money making tool. Like how PRs can suss out whether a blogger is only a black-hole for products, follwers and readers can quickly determine whether the blogger is only in it for the money. I was watching the very interesting twitter feed and I think this is a great post Marusya. I blog because I love it and it’s starting to become more of a business for me which is exciting. Being part of the blogging community is fantastic and I love the diversity of all the beauty blogs I read. The busines world will always be interested in blogs because personally I haven’t bought a beauty item in the last year that I hadn’t read about on a blog, or looked up a review for before purchasing. It’s an interesting time to be a blogger! Great post M! I couldn’t have agreed more – I blog because I love it & monetising helps me keeping the hobby going and doesn’t make it business. Well said. I think some blogger have found a niche in the blogging world and have been able to make money from it, which makes others question whether all blogs should be money-makers. Why question it? Do what you you love and love what you do. What a great opportunity to connect with other bloggers in your niche. With regards to the title of your blog post, I definitely think bloggers can blog for both – love and money, if they like. It doesn’t have to be either/or. I suppose if your experience or perception of business, is that there are no friends and that money rules all, then I can see how that would shape your view of blogging as a business. But if your blog monetizing experience is one of making money from your passion, with people who inspire and support you, where you can get rewarded – financially and non-financially – by doing what you love… Then, I guess you would see the business of blogging very differently. I know bloggers who have the latter experience and spring out of bed in the morning, because they get to blog AND make a living. That’s what I love about the opportunities that come from this amazing platform to express yourself and build community. Thanks for writing such a great post Maria, you couldn’t have said it better. I think if you have the time, drive and ambition to turn your blog into a money maker then go for it. Most blogs I read who do this are very transparent about it and don’t hide the fact that they’ve been compensated. Most of us just do it to fill a need to learn, write, create and connect and anything else is just a bonus. I agree with so many of the above comments this a great post. As a PR in the industry I think there are many of us still getting our head around this exploding ‘new media’ area of Bloggers and we are also willing to embrace it. We want to work with you and we understand that you want to work with us however we are all learning how to best ‘be’ together. Just like a new Mum has to learn what makes her baby happy and how to understand it’s little personality we want to start out on the right foot and offer bloggers the best possible information and assistance whilst looking after our brands / clients and business. I think we are all part of a very exciting new time in this world and it is wonderful we are all able to work together to develop it each and every day. I attended part of the ABBW last weekend and I was so impressed with the enthusiasm of all the girls I met, I hope you all felt the same from us ? great post! blogging is a personal choice. do what you love to do. don’t assume all bloggers are the same. Thank you so much for sharing this post! I’ve been lately wondering about the whole monetizing aspect of my blog. I enjoy writing, putting outfits together, and yes I am a finance professional. So when companies offer me something gratis for a review, it is nice, but trust me, it doesn’t put food on the table. The blogging community is nothing like the corporate world. People you go to lunch with will sell you out for their own benefit, not so much the case in the world of blogging. Sure there is competition and I think with every post you should bring your A game because honestly, if you did not enjoy writing that post, chances are your readers probably didn’t enjoy reading that post. This is where we can be ourselves, and say what we want, and not feel swayed one way or another! BTW…love the over the knee boots in today’s post! Excellently put, Maria. I think there’s enough room for bloggers who do this as a hobby (yet still maintaining a high level of professionalism), and for those who wants to make an income out of it. At the end of the day, it’s your passion for writing that shows. Thanks so much for doing this post M, during that talk with Bahar I felt like I learnt a lot, but there were things that I fundamentally disagreed with. I agree with you that bloggers cannot be lumped into one big group, we all have different goals and different reasons for blogging and I think that as long as we respect each other and our own voice then that is the best thing we can do. Maria, this is a fantastic post because it’s true – every blogger has their own uniqueness which makes their blog special. I started blogging because of passion…but if, one day, I can earn money from doing what I love, why not? Wow, this is amazing well written! I think I’m probably in the same boat as most bloggers, we do it because we love it, we spend countless hours devoting our time to read and writing blogs but get not payment out of it. hey don’t get me wrong if I could blog for a living that would be great, but sometimes I feel when money is added into the equation the honesty line gets blurry. But I think that’s just my feeling, It will take a strong willed person to continue to review products honestly when people and money are on the line. Simply by the fact that no company wants to pay someone that only reviews them well some of the time. I’m happy being a hobby blogger, as they say and I act professional, but I’m not ‘a’ professional blogger. Great post!! I blog as a hobby, but I don’t think it’s wrong if someone blogs for business purposes. If we can all respect each other, then I feel that it’s okay. It’s a really interesting debate – and on the PR side of the fence – it’s posts like this that help us to understand the bloggers’ point of view. We’ll read/listen/watch with interest to see how this all pans out and wait for the blogging community to let us know how you want to work with PRs. If at all! That’s very interesting, I think that if you love what you’re blogging about, it will show, to readers and PR people alike. My blog is for me, because I got sick of people tuning out when I started talking to them about M.A.Cs latest collection…..
Agree with you and the comments here that this is a very personal choice. I think very few bloggers actually make money from their blogs directly, but from opportunities that came from blogging. Like me and my photography, my blog has opened many doors for me. I couldn’t agree more. People should be free to express themselves in any way they want, if just as a hobby or turning it into a full time job. If you’re doing it as a hobby and opportunities appear then good for you. I have heard so much about this controversial presentation, I am really sorry I wasn’t there to see it for myself. I can definitely see both sides of it – I have a day job and I blog for fun.. at the same time my day job is in marketing, and I think as long as you’re totally honest with your readers it is okay to allow companies to gift you things, and to make money from your blog. It’s definitely an interesting topic! Simply one of the best analogies I’ve read Maria. The motivations of blogging and the competing forces to monetise or not for most of us who starts the blog off as a hobby changes over time. If there is integrity, it doesn’t matter what choices we make. You only have yourself to answer to and if you can sleep soundly at night, then that’s all that matters. This is a very balanced and objective account. Like you, I have only been blogging for about 6 months and I wanted to have a very clear idea of why I’m blogging. Therefore, I have stated my blogging principles in my blog so that I am always guided and have found that it has helped me to be focused and blog about issues which are relevant, useful and would make a difference to my audience. Thanks for sharing. Great post! I’m really enjoying the discussion here. I’ve only starting blogging in the last couple of months, as something fun, a way to express myself and to give my poor boyfriend some peace from hearing about beauty stuff all day. I’ve also recently realised that there’s a great community out there of beauty bloggers, which I’m more interested in becoming closer with, than competing against. Likewise, I’m more interested in writing about things I enjoy, rather than what a brand wants, however if someone does paid posts, that’s fine with me as long as it’s fully disclosed.